Even Turkmenistan has been swept up the railway route-opening trend. 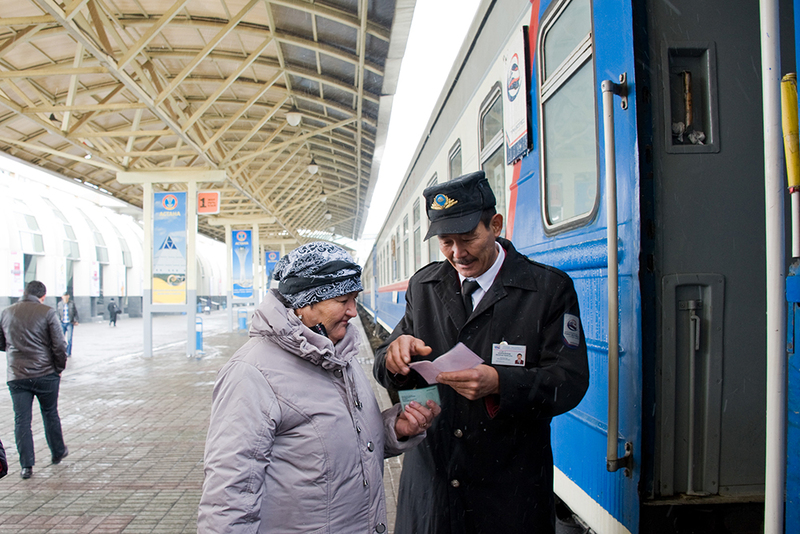 It is an exciting time to be a railway enthusiast in Central Asia. Routes have traditionally wended south to north, tying the region to Russia, where the center of geopolitical influence once lay. This is changing in two big ways. Some projects are flipping the axis of travel from east to west, bridging the expanse of Eurasia. In the meantime, governments are also understanding the importance of small, local connections in lifting their nations out of isolation. Such sweeping visions however, may yet get snarled up in red tape and hogtied by poor coordination, experts say. And there may not be enough money to go around. Much of the political and economic energy behind much of this broad trend is coming from China and its era-defining Belt and Road initiative — a catch-all term to describe a trillion-dollar string of sea and land infrastructure projects across Eurasia. In the last six years, Kazakhstan has invested more than $3 billion on upgrading its rail infrastructure, spurred on by the prospect of becoming a key node for freight traffic between Europe and China. In the spring last year, a train called East Wind took just 20 days to make its inaugural voyage from the Chinese port of Yiwu to a depot in east London. After disgorging its load of consumer goods, the 88 carriages returned along the same route laden with machinery, medical supplies, and even whisky and baby milk. Significantly, the train covered as much ground in Kazakhstan as it did in Russia, underlining Central Asia’s increased ability to compete with the Trans-Siberian route for transit traffic. An emerging rail connection between Khorgos, on Kazakhstan’s border with China, and the Caspian Sea port of Aktau, promises freight journeys that bypass Russia altogether. After unloading from Aktau, containers would be shipped across the Caspian and then continue their trip toward Europe through the Caucasus. But while such continent-spanning initiatives may get the bulk of the attention, it is the more specifically regional designs that could prove most transformative. One undoubted boon to Central Asian railway connectivity came with the rise to power in Uzbekistan of Shavkat Mirziyoyev, who became president following the death of his successor, Islam Karimov, in September 2016. Karimov favored investment in railway, but primarily to circumvent neighboring nations. One of the final and defining acts of the Karimov regime was to complete the $2 billion Angren-Pap railway line, which necessitated burrowing a 20-kilometer tunnel. A nearby connection that went through Tajikistan already existed, but relations between the countries have historically been shaky. In contrast with that isolationist approach, Mirziyoyev has instead trumpeted regional cooperation as a cornerstone of the 32 million-strong country’s future economic and foreign policy. When Kyrgyzstan’s President Sooronbai Jeenbekov visited Uzbekistan in December, he joined Mirziyoyev in stressing the need to finally kickstart the long-planned railway line that would connect their two countries and then China. “We now see a lot of activity emanating out of Tashkent, not just with the China railway through Kyrgyzstan, but reaching out to Afghanistan,” Pantucci told Eurasianet.org by telephone. Mirziyoyev in December also played host to the Afghan leader, Ashraf Ghani, for historic talks that produced an agreement to complete a railway line from the city of Mazar-i-Sharif, just south of the Uzbek border, through the towns of Sheberghan and Maymana to Herat in the west of Afghanistan. By latching onto an existing spur from the north, this railroad would better plug Afghanistan into Central Asia and offer Uzbekistan — cursed by its double-landlocked status — an outlet to the Persian Gulf via the routes to Iran. Even Turkmenistan, despite its chronic wariness of the outside world, has been swept up the railway route-opening trend, as its economy heaves under the weight of depressed prices for natural gas. The Lapis Lazuli railway that Turkmenistan’s President Gurbanguly Berdymukhamedov inaugurated in late 2016 together with his Afghan counterpart, Ghani, is intended to give Afghanistan an outlet to Europe. The short-terms benefits for Turkmenistan, which has pledged to build on this kind of project, are already on view. Speaking in November, Turkmen Trade Minister Doran Orazmyradov said trade with Afghanistan during 2017 had increased by one-fifth over the previous year. Turkmenistan exported mostly oil and agricultural goods to Afghanistan, Orazmyradov said. In late 2014, Berdymukhamedov, President Hassan Rouhani of Iran, and Kazakhstan’s President Nursultan Nazarbayev assembled for a symbolism-rich ceremony to collectively bolt together a final gold-plated section of track bridging the three Caspian nations. The intent was, once again, to give inner Asian nations means by which to reach the sea. None of this means considerable challenges to connectivity — hardware and software — do not remain. The five countries of former Soviet Central Asia use a 1,520-millimeter gauge that differs from that used in Europe and China. This discrepancy necessitates reloading cargo, which adds time to journeys. But Grantham, of Railway Gazette International, says such technical challenges are small change compared to some of the red tape that can clog up freight runs. “Managing cross-border bureaucracy is a big issue on the freight side — avoiding the need to unload at borders, making sure paperwork is in order,” he said. "Corruption is a problem in some countries. One freight shipper once told me the best thing they could do would be to double the salary of all the border guards, so that there is less incentive for them to demand unofficial payments,” Grantham told Eurasianet. The appearance of new transit routes requires clear lines of communication. Associations like the Warsaw-headquartered Organization for Cooperation Between Railways exist for this very purpose — to design and monitor the implementation of legal and technical standards for freight journeys. Although all five Central Asian states are members, only Kazakhstan sent a delegation to the organization’s most recent conference in December. Funding is the ultimate problem. The crises suffered by the region’s commodity-based economies have left governments increasingly unable to finance connectivity projects independently. And while Beijing has displayed considerable largesse in the past, this need not be taken as an indication of future policy. Pantucci argues that China is unlikely to overcommit itself financially as it eyes a “latticework” of different communications routes throughout the region, involving itself directly in some while piggybacking on others. However things pan out, “China knows it can afford to be patient with these things,” Pantucci told Eurasianet.